In the millennia before the Great Rain of Fire, the land today known as Karameikos sat near the pre-cataclysmic North Pole, in a cold and inhospitable land1. Some sparse remnants of the Brutemen race still dwelled in this northern land, where the expansion of human civilization had pushed them in the course of the last thousands years2; their country was only travelled, from time to time, by the occasional Oltec or Azcan pioneer, or by Blackmoorian explorers. The true masters of this region were the frost giants, who lived here in great number, and a few dragons – of which the red Yealeletherveri (active around BC 5000) is remembered as one of the most powerful and fearsome wyrms of history3. The Great Rain of Fire changed all this, pushing the Known World from the arctic latitude into the temperate one. Glaciers began to melt, frost giants started a retreat toward the highest mountains of the new arctic lands, and the country was slowly carpeted with forests, springs, and rivers. In this age, the land known today as Karameikos didn’t border the Sea of Dread; now-submerged lands extended many miles to the south, well beyond the present day archipelagos of Ierendi and Minrothad. The first people to set foot in post-cataclysmic Karameikos were humans from central Brun; they crossed modern Darokin and arrived in BC 2500 from the north into the southern Known World. They were the Taymora, who rapidly built an agricultural civilization of bronze-age city-states, mostly located along the southern coast of the Known World (many miles south of modern Karameikos), and of which little is known today4. Elf travelers and colonists coming from the Serpent Peninsula began arriving from BC 2250 in Taymoran lands5. They established friendly relations with the humans, who employed them as mercenary troops in exchange for lands. Centuries later (BC 2100), a larger group of elves who had split from Ilsundal’s migration toward the Sylvan Realm, came to the Taymoran lands; they were mostly divided among two clans: the Verdiers (wood and fair elves6) and the Meditors (water elves). The Taymora allowed them to settle in the forests north and east of their city-states, in the areas occupied by modern Karameikos and Minrothad. In the following decades, the Taymora had to contend with the resurfacing power of Grondheim, a local giantish kingdom7 along the northern border. The modern Karameikos region became a battlefield between the Taymora, with their elven allies, and the giants. The latter were finally defeated, and the kingdom of Grondheim crumbled; many giants were killed in the process, while others were enslaved by the Taymora, who put them to work and began building cities in the modern Karameikos region, to the north of their civilization’s heartlands. It is not known exactly how or when it happened, but before BC 2000 some cities of the Taymora began worshipping the powers of Entropy, and parts of the country slowly became dark places whose rulers were devoted to gruesome bloody and necromantic practices8. Undead creatures, such as nosferatu and vampires, made their appearance at this time, as well as the first recorded lycanthropic bloodlines, likely created by Taymoran experiments9. At last (BC 2000), a great civil war between followers of rival entropic Immortals ravaged the country, while at the same time a long period of seismic instability hit the southern Known World, which was shocked by recurrent earthquakes over the course of the next three centuries10. Many people perished, and many cities were destroyed by the earthquakes and volcanic eruptions, or by the civil war itself. Gradually, many Taymora began to migrate northward hoping to find shelter in the forested country at the mountains’ foothills11. By BC 1750, earthquakes had broken some parts of the Taymoran lands off the coast of the Known World and had plunged many regions beneath the sea. Many vestiges of the Taymoran civilization had already been destroyed by those events, and the last remnants of the southern Taymoran cities and lands disappeared under the waves in the devastating volcanic explosion of BC 1720, which gave the southern coast of the Known World the appearance it has today, with the creation of the modern archipelagos of Ierendi and Minrothad. In their new lands, north of their lost homeland, the Taymora were unable to rebuild their civilization, and slowly lost most features of their advanced culture in a couple of centuries (BC 1700-1500). Neither were the few surviving giants, freed from Taymoran slavery, able to establish full control over the area, and they retreated into the wilder and more isolated areas. Elves also survived the catastrophe, but the Meditor water elf clan was stranded alone on one of the recently-formed islands south of the new coastline (the one later called Alfeisle); some time later (BC 1720), the Verdier wood elves, wishing to reunite with their kin, migrated from the coastal forests to Alfeisle itself. The rest of the Verdier fair elves, instead, preferred to continue to live in their forests, in relative tranquillity; the latter were the ancestors of the Vyalia clan. In the centuries between BC 1700 and BC 1500, the population continued to decline in the Karameikos region. This was due to the aftereffects of the recent seismic cataclysms, and also to the fearsome explosion of a Blackmoorian device which happened in the Broken Lands in the same BC 1700; debris and dust lifted by the event darkened the skies for years, plunging the Known World into another brief ice age. Around BC 1500, a Nithian private expedition led by the Ptahr-al-Dar12 clans came from the sea and began to settle the coasts of the land corresponding to modern Karameikos13; inland, they found the descendants of the Taymora, who they called the “People of the Night”, and swiftly subdued them14. The legacy of the ancient Taymoran knowledge only survived in the secret society known as the Sons of Night15, a cadre of sorcerers devoted to darkness which still lives to this day. Subsequent expeditions by the Ptahr-al-Dar also settled part of modern Darokin (the sites of present day Akorros, Selenica, Dolos, and Darokin City); there they were the first human inhabitants to build permanent settlements16. At the same time, the Immortal Pflarr created a race of jackal-headed humanoids in his image called the Hutaaka. He put colonies of them to live in the Black Peaks mountains, north of the lands conquered by the Ptahr-al-Dar. The Hutaakan culture borrowed most of its traits from the Nithians, but with a stronger accent put on mysticism and philosophy. They lived as a federation of tribes, tied together by the authority of the High Priest of the Temple of Pflarr, located in a secluded valley in the heart of the Black Peaks mountains. The Nithians’ colonizing attempt soon proved a complete failure. Overwhelmed by the climate, plagues, fierce beasts, and the land’s savage conditions, within a century the Ptahr-al-Dar’s ruling aristocracy was decimated. They lost contact with the Nithian Empire and with their sister colonies in modern Darokin and reverted to stone age technologies and a pre-agrarian lifestyle, forgetting any knowledge of metallurgy. In these wretched conditions, the social differences between Nithian conquerors and the “People of the Night” slowly waned, as the two races blended together, giving birth to a new culture that was no longer Nithian. 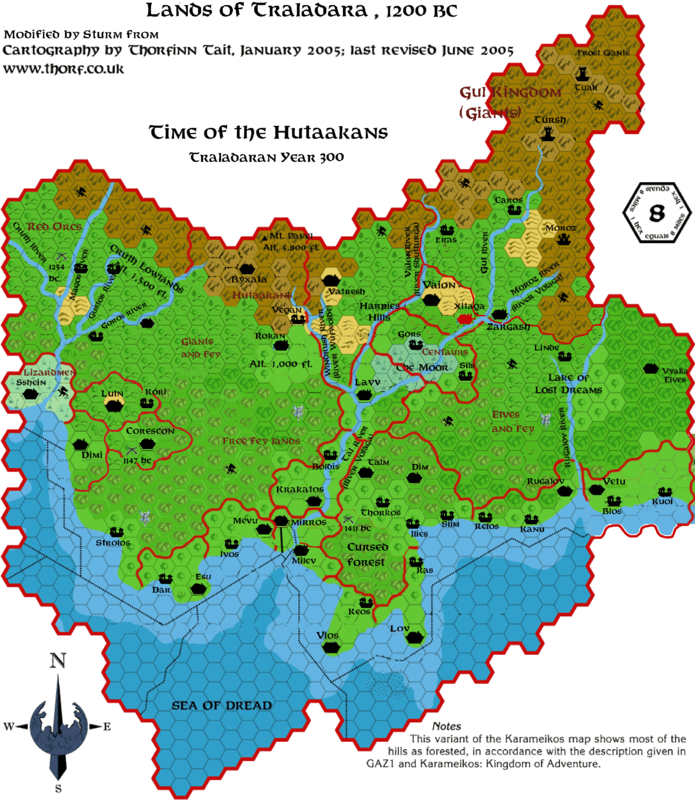 Seeing the terrible conditions which had befallen the southern humans, the Hutaaka of the Black Peaks decided to help them recover; they also saw the opportunity to establish control over them, in order to gain plenty of servants and workers. Thus, around BC 1400 the Hutaaka slowly began to take under their protection the human settlements nearest to them, reteaching them the agricultural techniques and bronze technologies they had lost. In the process they began to rule them as benevolent masters, but kept from them some advanced technology (like iron smelting) out of fear of an uprising against them17. Later, local Traldar rulers (oligarchic councils and kings) arose in many areas of the country, always advised (and watched over) by Hutaakan priests and sages. Eventually, under the leadership of the Hutaaka, the new bronze-age Traldar culture emerged, characterized by city-states, warrior-kings, and hero-worship. In the rest of Karameikos, Hutaakan influence was much stronger, in particular in the west, where the powerful Hutaakan dominion centered on the city of Achelos was founded22. Over the centuries tension developed between the Hutaaka and the Traldars, even leading to an open rebellion against the Hutaakan influence, enacted by a King Tahrek ‘the Bright' around BC 1280. Tahrek was the ruler of a dominion in central Karameikos who managed to win some victories against the Hutaaka before being abandoned by his allies and crushed23. This was a singular episode of conflict between the Hutaaka and the Traldars; aside from this, the Hutaaka continued to advise and protect the Traldars, teaching them what technology and magic they deemed wise, in exchange for servile labor. Near the end of this age the Nithian Empire again began to turn its greedy eyes on the Sea of Dread, conquering the modern Minrothad and Ierendi archipelagos (BC 1100-1000), and thus subjugating and absorbing the Traldar colonies in those islands. Trade with the Nithian Empire in those years brought iron weapons into the southern lands of the Traldars; leaders, kings, chieftains, and elite guards sported them, but most of the Traldar states continued to lack the knowledge needed to fabricate them. The Traldars’ prosperity came to a sudden end when a huge horde of gnolls – the greater part of those tjat had fled from the Nithian Empire in BC 1050 – poured beyond Traldar borders from the north-west (BC 1000). The Hutaakans, aware they could not resist the gnolls’ savagery, decided to retreat to their most secure mountain shelter, the Valley of Hutaaka (seat of the Temple of Pflarr), even abandoning some of their greatest cities like Achelos; they brought with them some Traldar slaves, and disappeared not to be seen again, leaving the Traldars alone to face the fierce enemy. The terrible Great Beastmen Invasion which followed (BC 1000-992) saw the nearly total extermination of the Traldars. The humans were no match for the gnolls’ iron weapons and unheard of ferocity. Many clans and their cities were destroyed, while other fled overseas (like the inhabitants of Mirlenos – a town on the site of modern Marilenev, who were led by King Milen in a long voyage beyond the Nithian dominions, toward Davania). The whole western half of the region was ravaged by the invaders. The Immortals, fearing for the very fate of the Traldar civilization, decided to preserve it by bringing a number of them into the Hollow World. In the most tragic hour, however, King Halav of Lavv and Queen Petra of Krakatos, with the aid of the Hutaaka-educated hero Zirchev24, managed to gather together the Traldar forces that were left and stopped the gnolls at the Battle of Volaga (BC 992)25. The battle saw the deaths of both King Halav and of the gnoll chief Flaghr; left without a leader, the gnolls began quarreling amongst themselves and their war effort suffered. United by the memory of King Halav, the Traldars managed to slowly get the upper hand against the gnolls, but another forty years would be needed to see the last gnoll warbands driven out of Traldar lands to the north-west (about BC 950). The war against the gnolls and the invasion’s consequences (famine and plague) reduced the Traldar population to one-fifth of the previous one - many of their most prosperous cities had been destroyed, most of their warriors killed; the wilderness reclaimed a vast part of their lands, as there were no more people living on them. The remnants of this people temporarily stayed allied together under the banner of Halav’s and Petra’s descendants (who ruled the united central kingdom of Krakatos and Lavv), but the Traldar civilization had definitely fallen into decline. With communications made more difficult by the lack of infrastructure maintenance and the country’s depopulation, peripheral communities become more and more independent from the center, while the memory of King Halav’s days faded and passed into legend. Thus began the Traldars’ Dark Ages. Even with the gnolls gone, the land would not know peace. In BC 933 the Vandars invaded the region from the west; they were a northern human warrior-people, who had migrated from Norwold centuries before, and had taken part in the wars between dwarves, halflings and orcs in the modern Five Shires region26. Skilled horsemen, they brought further destruction in the already devastated Traldar lands. The Vandars pushed deep into Traldar territory, as more and more tribes migrated there from the Five Shires (up to BC 910), but their cultural influence was greater in the western half of the country. Within a century, the Vandars adopted a sedentary lifestyle, and settled as rulers among many Traldar clans, even founding or re-founding some towns (like Achelos in BC 900, and Halag in BC 800). During this time the knowledge of iron smelting eventually became widespread in the Traldar lands, which definitively entered the iron age. Only around BC 800, when the worst effects of plagues, famines, and wars began to lessen, did the population begin a very slow recovery. For many decades, the political situation continued to be troubled by wars and fights between the Traldars and Vandars, with the latter slowly gaining the upper hand. After BC 700, when the worst years of the Vandar invasion and dominion had passed, the conquerors began a process of intermarriage into Traldar clans, which ultimately brought about - around BC 500 - the blending of the two cultures into one. The culture of the Vandar masters imposed itself over the declining culture of the Traldar people, even as it adopted many traits of the Traldar culture. The most widely used tongue of the country came to be a Vandar-descended tongue heavily influenced by the Traldar dialects. The merged people gradually became known as Traladarans, and their land as Traladara27. Although the Traladarans were divided into many villages and communities, they were kept united by their faith in their Immortal patrons - Halav, Petra and Zirchev – whose stories were kept alive by the oral tradition of the Ballad of King Halav, which told the story of their deeds during the Great Beastmen Invasion; the veneration of Halav, Petra, and Zirchev became widespread across Traladara during this age, slowly replacing that of the old Traldar and Vandar Immortals. This age also saw the arrival of the elves, who suddenly and mysteriously appeared in the lands to the east of the Traldars (BC 800). They had abandoned their far-away homeland, the Sylvan Realm, through the magical Rainbow Bridge, under the leadership of Mealiden Starwatcher. While the main body of the migration passed through Traladara to settle north of the Black Peaks mountains (on the site of the future Canolbarth Forest), one of their clans - the Callarii wood elves - chose to split from the migration and to settle in the central forests of modern Karameikos – the Radlebb Woods, parts of the Dymrak Forest, and the forested hill country between the Highreach and the Hillfollow Rivers. The Callarii established friendly relations with the more peaceful human clans and fought against the more warlike ones28. Nevertheless, this age was troubled by recurring humanoid invasions. Since BC 650, the Hins' successful struggle against their orcish masters during the Time of Heroes had pushed a significant number of orcs into western Karameikos; many of them - like the Blackstone and the Jagged Claw tribes - settled in the Cruth Lowlands and presented a serious problem for all the western Traladaran clans. Still another wave of invasions and raids descended on the Traladarans in BC 491; hordes of bugbears, goblins, hobgoblins, kobolds, orcs, and ogres, fleeing the onslaught suffered against the dwarves in the Battle of Sardal Pass (BC 492), poured from the north into Traladara. Some of their tribes, like the Greyslayers orcs and numerous ogre families, settled in the Cruth Mountains and Lowlands area in BC 491, while the rest staged a mass invasion of central Traladara the following year, again bringing death and destruction. Although they were initially attacking without a plan, the humanoids found a new and fierce leader in Leptar29, a brutal hobgoblin chief; they accomplished much devastation, the most infamous of which was the destruction of the cities of Krakatos and Lavv, last legacies of the old Traldar civilization in these lands. The humanoid invasion also brought about a devastating plague which ravaged the whole country. The Traladarans, now strengthened by the Vandar warrior tradition, managed to hold off the humanoids; the hordes of Leptar were defeated in BC 488 and his humanoid army splintered into a number of small hordes, but the war against them continued up until BC 480. At the end of the war, many bands of these creatures had settled in the south-western woods, in the Dymrak Forest, in the mountains, and in the wilds of Traladara, where many of them still live today. The arrival of the humanoids also hit the more sparsely populated and isolated Callarii settlements which dotted the woodlands; many wood elves decided to retreat to the secure depths of the Radlebb Woods or to the western reaches of the Dymrak Forest (the rest had fallen into the hand of goblin tribes), consolidating their hold on them and abandoning almost all their outlying settlements. The end of the humanoid invasions also marked the beginning of the late Dark Ages of Traladara. The fall of the Nithian Empire (BC 500) and the disappearance of its culture from the Known World had no relevant consequences for Traladara. After the slow recovery begun in the 9th century BC had been halted by the events of the 6th and 5th centuries BC, the population began growing again, starting from the 4th century BC. Settlements which had been on the verge of collapse began a stable recovery, while new settlements were built and prospered in coastal and riverside areas. The political landscape became more stable, as the main settlements became the seat of small principalities called “banates”. Toward the end of the first millennium BC, Marilenev arose to become the major city of Traladara, followed by Halavos (built near the site of old Lavv), Lugsid (a settlement born of the shore of Lake Windrush), and other towns30. The end of the Dark Age also saw the first successful attempt at uniting the Traladaran communities into one kingdom. On the eve of a war against the humanoids, anticipated by a time of renewed humanoid raids all over Traladara, Ban Ithron Zlatarev31 succeeded in BC 195 to the throne of Volaga and managed to unify under his banner some of the other princes, leading them to victory over the humanoids. In the following years, he expanded his domain through force and diplomacy to nearly all of Traladara, and in BC 171 he was crowned in Marilenev by priests of the Traladaran patrons as “King of Traladara” – marking the first use of this title in history. In BC 147 Ithron died, and his kingdom would not outlive him for long; his successors couldn’t manage to keep the quarrelsome clans united, and the kingdom slowly fragmented, until at the half of the 1st century AC the title of king, by then empty, fell into disuse. Hostile humanoids were not the only ones to migrate in the wild Traladaran lands. A number of rock gnomes led by the Hilltopper clan, survivors of the slaughter of their own race perpetrated centuries before by the kobolds under the Hardanger Mountains, after many wanderings came from the north to Traladara around BC 100, and settled in the lands between the Hillfollow and Windrush Rivers, where they built their own settlements, the largest of which was called Highforge. The turn of the first millennium AC marked the beginning of an age of rapid demographic growth for Traladara. Both the consolidation of the Thyatian Empire to the east and of the Kingdom of Darokin to the north-west helped Traladara to enter a more stable age. From the 1st to the 4th century AC, the population began a slow but steady process of resettlement of the wilderness – mostly the woods and the forests. Settlements grew and some of them became prosperous trade cities. Thanks to its plentiful natural resources - such as wood, furs, and precious metals - Traladara began to be frequently traveled by merchants of neighboring countries, mostly Thyatians, Darokinians, and Minrothians. Even a Rockhome dwarven clan, the Stronghollow - following rumors of precious metal veins to be mined below the Altan Tepes - came to Traladara, where it was welcomed by the gnomes in their Kingdom of Highforge; the dwarves settled there around AC 300. The increase of trade and steady passage of people though land routes improved the cultural unification of the Traladarans. Religion was another powerful factor of unity. Around AC 400, after centuries of cultural contacts, Thyatian missionaries led by Lucor32 - who subsequently was made a saint by the Church of Traladara - translated into Thyatian the Ballad of King Halav33. This event prompted the organization and the consolidation of the churches devoted to the Traladaran patrons, bringing about the formation of the Church of Traladara in Marilenev, as well as of other branches of the faith, called churches of Halav, in the rest of the country. The Traladaran communities continued to stay divided and independent of one another. Depending upon the era, they waged war or traded amongst each other, allying together only to repel a foreign invader. Some nobles even managed to become quite powerful local lords during those centuries; in reality, their domains and authority only reached as far as their swords. The most important of these petty nobles was Bogdan Ivanovich34, Ban of Marilenev, who succeeded to the Marilenev throne in AC 301 and began a campaign of unification of other settlements and clans, both by diplomacy and war, which concluded in AC 324 when he was crowned King of Traladara in Marilenev; his son Anton even managed to conquer the Cruth Lowlands and the city of Achelos in AC 327, and to found a vassal banate there. Unfortunately, internal strife erupted at Bodgan’s death in AC 356, breaking the recently-formed kingdom apart. In the Cruth Lowlands, the legacy of Anton was preserved after his death in AC 364, and the Ivanovich family kept control of the banate, allying itself with the Hojah family of Halag. The 5th century AC saw some very important events for Traladara. Around AC 410, merchants coming from the southern isles brought to Traladara the plagues of lycanthropy and vampirism with which they had been infected in the east. This sparsely-populated region of dense woods and small villages was the ideal hideout for a werewolf or a vampire. In the following decades, many communities were terrified by these creatures and Traladara became known as the favourite haven of such horrible monsters. Those years also saw a new emergence of old Taymoran-descended nosferatu. The religious hierarchies gathered forces to counter those evil threats; in Halag, the order of the Knights of Halav was formed to fight vampires and lycanthropes. The demihumans – elves and gnomes, mostly - for whom those curses were deadly, closed their borders and were forced to begin true hunts to eradicate infected humans from their lands. After a phase of dramatic, initial spread, the two curses were contained, but they would again see a rise at the beginning of the 6th century AC and would never completely leave the region. The 5th century also saw the beginning of the Darokinian attempts to subdue Traladara35. Four wars (called the Traladaran Wars in Darokinian histories: AC 412-17, 444-50, 488, and 490-93) were fought in this century between the Traladarans and the Kingdom of Darokin, which also saw intervention by the insular city-states of Harbortown and New Alphatia in the Minrothad archipelago; most of those conflicts were also internal wars spurred by political and religious differences between various Traladaran clans. Even though Darokin was only successful in holding the northern part of Traladara for a short period of time (the first time directly, the second time through the alliance with the Traladaran Duke Demara of Vaion, who managed to be crowned as King of Traladara), the wars had a series of important consequences. First of all, cultural influences by Darokin and, to a lesser extent, by Thyatis, led to the abandonment of the old traditional Traladaran noble titles (ban, zhupa) across the country, in favor of imported Darokinian and Thyatian titles (like duke, count, and baron). This process was slower in the western part of the country, where local cultural identity was stronger and less permeable to outside influences36. Second, the wars changed the political landscape of Traladara, leading to the emergence of newer clans (like the Koriszegy, the Vargos37 of Halag, and the Ivanovich of Achelos, who assumed the ducal title) and to the extinction or the exile of old ones (like the Hojah of Halag, who abandoned Halag with a large number of their followers our of religious differences in AC 450, after their defeat in the Second Traladaran War, migrating to the Gulf of Hule38). Third, the alliance against the Darokinian threat prompted the formation of the Traladaran League. At first only a military alliance to last until the defeat of Darokin, the League was confirmed as a permanent institution after the Darokinian defeat in AC 493, with a governing body – the Diet of Marilenev – seated in Marilenev, which had become the most important city of Traladara. For a time it seemed that the Traladaran League could be the unifying factor of the Traladarans, and that the Diet could make the various Traladaran principalities act as a single body – like when they chose the wizard Perrantin as First Speaker to oversee the sending of a Traladaran army to assist the Flaems of the Highlands defend against a feared dragon attack on the Known World, during the Time of the Second Dragonlord (AC 511)39. However, hatred continued to run deep between Traladaran clans, and intrigues were frequent and harsh. Rivalries among the clans, and uneasiness against Marilenev’s leading position within the League, would have ripped the League apart within AC 600. By this year, many noblemen who ruled peripheral lands acted indipendently from, and without consulting with, the League’s leadership in Marilenev. Around this year, a newly-risen descendant of Demara claimed the title of King of Vaion, thus marking the first exit from the League. Some years later (AC 612), after the Marilenev-supported Baron of Halag, Ulstagh Vargos40, was killed, the new cadet-branch Vargos ruler of Halag assumed the title of duke. In response, Duke Vasil Ivanovich of Achelos proclaimed himself King of Achelos. It was the end of the League, which was formally dissolved in the same AC 612, and the beginning of another age of strife. Also, the League’s dissolution marked the end of Marilenev’s hegemony over Traladara; the weakening of the Duke and of the old landowning aristocracy of the city prompted the new merchant families represented by the trade guilds to take power in the city with a bloody coup, which ousted the old families and reduced the duke to a mere figurehead which now had to rule from Castle Marilenev, in the countyside south-west of the city41. Conflicts between the various clans and cities would break out openly in AC 653. Another wave of vampirism and lycanthropy, together with the spread and the increase of activity of entropic cults, marked the beginning of a time of religious wars between the clans, known as the Holy Wars, which would go on until AC 728. Fear of an uncontrolled spread of vampirism exploded when the King of Darokin, Aden III, was discovered to be a member of the undead42. This discovery turned into psychosis and war when it became clear that many Traladaran clans hosted night creatures within their ranks. This stream of conflicts was terrible and wiped out whole clans, going on intermittently among persecutions, stakings, famines, and plagues. Heroes and villains were raised and perished during this age; one of those was Gygar, the powerful wizard-lord of Mistamere Castle (on Lake Windrush) who managed to carve a vast dominion in the surrounding area43. But this nearly century-long series of wars saw many terrible events, like the rise and fall of the entropic cult of the infamous Monastery on the Hill44, the transformation of the Sulescu family head into a nosferatu, a resurgence of orcish and hill giant activity in the Cruth Lowlands (caused by the defeat of orcs in the Shires around AC 700), and the rise and defeat of Queen Elendorath of Vaion, who attempted to expand her domain enlisting humanoid tribes under her banner45. The last years of the wars, known as the Vampire War (AC 720-28) were particularly terrible. The necromancer Morphail Gorevitch-Woszlany, Count of Gorenenov, called the “Black Count of the Moor”, became a nosferatu after a dark pact with the Immortal Alphaks in AC 720; he began an aggressive expansionist policy against the other clans. Other cities, including Marilenev, Vidrin and even Selenica, allied against him, ultimately defeating Morphail in AC 728 and forcing him into exile46. At the end of the war, Gorenenov and Lumm47 had been destroyed; a number of clans allied with Morphail chose rather to follow their ruler and migrate to the Highlands than submit or continue fighting (those were the ancestors of the Boldavians of the Highlands). Diseases, misery, and famines plagued Traladara during the Holy Wars and during the whole 8th century AC. Many settlements had been destroyed, many clans wiped out, many people had died and many others had left for foreign lands. Once proud and wealthy cities and towns, like Vaion, Halavos, and Volaga, lay in ruins; Zadreth had been abandoned at the beginning of the Holy Wars due to a plague; and the survivors of Lugsid had abandoned their town to pillage, seeking refuge on the island of Fogor, in Lake Windrush48. Thus, the wars marked the beginning of another time of demographic loss. Dark forces, who had entered Traladara during the wars, continued to feed on those fool enough to ally with them – like Count Koriszegy, whose lands were cursed and abandoned after he had signed a pact with Entropic powers (AC 783). Another two centuries would pass before the Traladarans would recover from this time of wars and misery. In the first half of 9th century AC, dwarves fleeing from persecution in the Highlands region during the Year of Infamy (828 AC) came south; most sailed toward Minrothad, where the local government granted them the opportunity to settle of Fortress Island, but some stayed in Traladara, settling among the human communities. Meanwhile, the main branch of the Marilenev dynasty died out when the last Duke of Marilenev, Radu, perished in AC 872; the ducal title was abolished, and Castle Marilenev was inherited by the cadet branch of the family, while the city also formally became an oligarchic republic49. On the eve of the 10th century AC, Traladaran communities were again in a phase of great economic growth; coastal cities had again entered a time of economic rise, and even some inland settlement was growing again (like Vatresh50, built over the ruins of Lugsid). The Thyatian Empire, more than ever interested in the vast wood deposits of Traladara, then decided to put its hands on them by conquering the region with the force of arms before the Traladaran states strengthened again or someone else began their conquest. The campaign was launched in AC 900. The Thyatian armies, led by General Flavian Osteropolus51, quickly seized control of southern Traladara, conquering Marilenev and declaring the whole country a protectorate of the empire; Marilenev was renamed Specularum and became the seat of the Thyatian governor of the Province of Traladara. Additional campaigns were launched in the following months against the northern and western clans; the north was easily subdued, while the west held for a longer time against the Thyatians. Halag fell quickly to the forces of Legate Alharbius, but the Kingdom of Achelos required greater efforts to be conquered, which happened in AC 901 with the siege and destruction of Achelos town52. However, skirmishes in the Cruth Lowlands area would have continued in the following years, up to AC 903. Later governors had to quell the uprising of the northern clans in the following years, and consolidation of Thyatian rule over Traladara could be said complete only by AC 91053. Despite some damage wrought by the troop movements, for the first time in centuries the Thyatian conquest managed to tie together the main parts of the country. The presence of small Thyatian garrisons helped to make communication routes safer and Traladara’s inclusion within the trade network of the large empire made trading even more lucrative. A number of Thyatians migrated in the following decades to Traladara, mostly settling in the cities and in the southern communities. Lands far from main trade routes and towns were however largely neglected by the Thyatian provincial government, and mostly left to themselves; this fate befell, for example, on the Cruth Lowlands area, depopulated by prolonged skirmishes between Thyatians and local rebel forces, and then invaded by orcs chased again from the Shires in AC 944. Despite the beginning of the construction of Riverfork Keep in that same year, the northern half of this area was gradually abandoned by humans (who resettled to the south, in Luln or Halag) and fell under the control of the orcs within the next twenty years54. In AC 970 the Thyatian Duke of Machetos, Stefan III Karameikos, was granted by Emperor Thincol the title of grand duke and the Traladaran lands, in exchange for his rich ancestral duchy. Thincol, wishing to heal the empire’s finances using Machetos' rich assets, was eager to offer Stefan a good deal of autonomy. Thus, the new grand duke, even if ruling over an effectively autonomous realm, benefited from the fact that, apparently, his lands were still part of the Thyatian Empire. Stefan, who renamed Traladara with his family name, brought with him his most trusted advisors and some of his relatives, to whom he entrusted titles and lands in his new dominion. Some of them took possession of older Traladaran settlements and simply gave them a new Thyatian names (like what happened with Threshold and Vorloi), others established wholly new settlements (like Kelvin, built of the site of ancient Lavv, and Penhaligon, built on the ruins of Vaion). The Thyatian noblemens’ settlement was not always peaceful: in many cases they had to impose their authority with force, and in some cases they were responsible for atrocities against the Traladarans, whose rights they didn’t acknowledge; the latter was the case of the Grand Duke’s cousin, Ludwig von Hendriks, who seized Halag and renamed it the Black Eagle Barony. The powerful Traladaran families of Specularum, who had until now controlled the political and economic stage of Traladara and had largely done as they pleased under the Thyatian governors, fearing a change of attitude by Stefan, caught the opportunity to try to recover the control of their country. Their subtle intrigues failed when, in AC 971, clan Marilenev headed an untimely and violent revolt in Specularum and of the surrounding lands, which was brutally crushed by the grand duke; the Marilenev clan was nearly exterminated, while the rebellious forces from surrounding lands were cornered in the ruins of Krakatos and defeated after a brief siege55. In the following years Stefan called to him many cadet members of Thyatian noble families, men and women gifted with heritage and skills to rule, but not destined to inherit their family titles. Adventurers, nobles, and merchants came to Karameikos and they came to represent the largest immigration ever experimented by this country during its modern history. Intermarriage between Thyatians and Traladarans became increasingly common after AC 970, giving birth to young people of mixed heritage who more and more tended to see themselves as Karameikans – not as Thyatians or Traladarans anymore. Indeed, in the thirty years after Stefan’s seizure of Traladara, Thyatian presence has grown to nearly one-fifth of the human population of Karameikos, with another fifth being people of mixed Thyatian-Traladaran ancestry. In his first thirty years of rule, the Grand Duke has improved infrastructure, fortified important communities and his realm’s borders, built an army to defend it, and created a network of loyalties and alliances with the Traladaran clans and with his Thyatian vassals. Examples of this are the building of Castellan, Rugalov, and Duke’s Road Keeps, as well as the construction of paved roads like the Westron and the Duke’s Roads. Moreover, Stefan supported the Thyatian patriarch Olliver Jowett, who had split from the Church of Thyatis, and his heterodox ideas, financing the creation of the Church of Karameikos to further improve the sense of autonomy of his country from the Thyatian Empire and to weaken the Church of Traladara, which had opposed and still was opposing his rule. The new church had an unexpected success, winning the favor of some young Traladarans and quickly becoming the second faith of the country. This last migration of Thyatians has had a mostly positive effect on Karameikos from a demographic perspective because, besides generating a notable rise of the population, the Thyatian immigrants have given the country a new expansionist thrust toward the widening of the arable lands and the conquest of the wilderness. Nevertheless, to outside eyes Karameikos appears as a region still extremely wild in most of its lands, where an adventurer or a pioneer willing to risk their life fighting against nature’s perils and monstrous enemies will find cheap lands for the grab, and where civilization advances through constant strife against he wilderness and their dangerous residents. Adventure module B8 – Journey to the Rock, introduced the ancient city of Tuma and its background. Even though the module had a generic setting, it gave some suggestion on how to include its scenario and background in the Known World setting. Two options were given here: the first was to place Tuma in the mountain or hill region north of Lake Amsorak in Darokin; the second was to place the scenario in the mountain country west of Wereskalot, in the Five Shires, or west of Threshold, in Karameikos. The later adventure module B1-9 – In Search of Adventure, supported B8’s second choice by placing Tuma in Karameikos' mountains, but had the Journey to the Rock adventure start in the area north of Threshold. Placing Tuma’s setting is not so easy, because the area’s map featured in B8 is quite large (about three 8-miles hexes from west to east, and two from north to south) and placing it north of Threshold would alter the terrain featured in GAZ1’s and other supplements' maps. The best choice seems thus to place B8’s map north-east of Threshold – looking at GAZ1’s 8-miles per hex map of the Grand Duchy, it would be found beyond the mountain hexes that surround Threshold in the north-east, in the hill hexes that border that border the Republic of Darokin. This way, the whole adventure area would be split between Karameikos (where Arkayz' manor, the wooded lands west of it, The Barrens and Barkel Mountains would be found) and Darokin (where the ancient site of Tuma, Lake Neshonan, and Krayzen Mountains would be located). The choice to have Tuma in Karameikos seems better, not only because it is supported by a later module (B1-9), but also because it is easier to integrate this scenario with the existing setting. The names of ancient Tuman kings featured in B8 (Alcidaxes, Belkazar, Calobanes, and Delophenes) have a vague Greek or Middle Eastern flavor, and thus can naturally be linked with the ancient Taymora and Traldar cultures which existed in the Karameikan region. The rise and fall of Tuma, moreover, can be merged easily with the history of Karameikos, in particular with the ages before and after the Great Beastmen Invasion, which were left quite vague by official supplements. Thus, this article (and also the accompanying article about Karameikos’ demography) assumes that Tuma was located in the mountains of Karameikos, suggesting the following way to integrate history of the city in Karameikos' history. Tuma’s origins trace back to the fall of the Taymoran civilization. When the catastrophic civil war and earthquakes that made the southern Taymoran lands sink under the sea, many refugees and survivors from the southern lands sought safety in the northern forests, a small group of them pushed further north well into the mountains, finding shelter in a secluded mountain valley of the Black Peaks. There they founded the settlement called Tuma some time after BC 2000. In the troubled centuries which followed, Tuma managed to survive the cataclysms that succeeded until BC 1700 unscathed, growing into the main local settlement through which passed the route that linked the southern lands to the rest of the Known World. After some centuries, it established regular trade with the Nithian Empire, acquiring the knowledge of iron smelting through it, and then peaceful relationships with the Hutaaka and the Traldar settlers to the south after BC 1500. Tuma was again substantially unhurt - thanks to its regular links with the Hutaaka and the Nithian Empire - by the hardships that reduced the Traldar settlers to the south to little more than hunter-gatherers savages. With the passing of years its relationship with nearby Hutaaka grew into a strong alliance, which allowed in Tuma the birth of an advanced tradition of arcane studies centered on earth, metal and rock. When the Traldars managed to rise again under the protection of the Hutaaka, Tuma benefited from this fact, establishing a lucrative trade with the Traldar kingdoms – while keeping from them iron technology and the most powerful arcane secrets, like what the Hutaaka did. In this age, Tuma rose to become the foremost power of the region. The town grew into a powerful city, and its domains extended both to the north and to the south of the Black Peaks range. When the Great Beastmen Invasion hit the Traldar lands, the Tumans were shocked by the Hutaaka’s choice to abandon the humans to their fate. At the start of the war the Tumans sent contingents of their soldiers to fight alongside the Traldars, but they preferred to retreat from their southern holds when the fight seemed lost. Only after the worst of the gnolls' invasion was fought back by the Traldars did the Tumans expand again southward, taking advantage of the weakness of the Traldars and taking part to the wars between the gnolls, the Traldars and the Vandars in the 10th century BC. During this age, Tuma was still a major player of the area, but the decline of the Traldar kingdoms and the disappearance of the Hutaaka deprived the city of a large part of its wealthy trade. The decline in which the Tuman royal court fell in this century stirred up dissension among the city’s populace, who rose against the king around BC 900; the monarchy was overthrown and the powerful magic-users of the city established an oligarchic rule. They used their rock- and metal-melding magic to change the face of the city, which assumed a nearly-alien appearance in regards to other contemporary human settlements - hundreds-of-feet high buildings made of metal were raised, streets were paved with metal as well, filled with magical constructs, and so on. But the wizards' reserved and aloof attitude slowly isolated Tuma from the outer world; the city withdrew from major conflicts, only fighting to defend itself against new enemies, like the Vandars or the humanoid hordes. With time, most of Tuma’s outlying possessions were lost. Nevertheless, thanks to the wizards' magic, the population within city walls lived well. After BC 700 Tuma, left more and more isolated, then become a target of powerful Nithian lords devoted to Entropy, who coveted the ancient arcane secrets the city’s wizards kept. They launched a series of attacks on Tuma, supported by their armies of mercenaries, humanoid slaves, and undead. After a century-long and valiant resistance, the Nithians and the dark powers with which they had allied decided that if they were not to grasp those secrets, no one will ever had: they casted a powerful curse on the city, which removed it from the Prime Material Plane and imprisoned it and its inhabitants in another plane. Thus, the city, its people, and its secrets disappeared from the face of the Known World in BC 600. The magic that kept Tuma imprisoned in another plane has weakened during the course of centuries. Sometimes it happens that the city – but not its inhabitants – temporarily reappears in its ancient site, only to fade some time later. Local adventurers may spot or even enter it, and some tell tales about an alien magical city found in the Black Peaks range. However, today nothing is known about Tuma’s fate. Ancient historical records may mention the city as one of the Traldar kingdoms of the ancient age, but not much else can be gathered about its history. Only one man knows the truth: he is Lirdrium Arkayz, one of the last two members of the ruling council of Tuma, who still tries to break the curse which affects its ancient people. Arkayz lives in a manor east of Tuma’s ancient site. The Caves of Quasqueton were introduced in adventure module B1 – In Search of the Unknown. Later the dungeon’s location was placed near the source of Achelos River in the map of the Known World included in 1983’s Expert Set. B1 told the tale of two adventuring companions, Zelligar the wizard and Rogahn the warrior, who had built a huge underground complex far from civilization; after having saved the civilized lands to the south from a barbarian invasion, the two disappeared altogether during an expedition in the barbarian lands to the north. You can leave Quasqueton dungeon where it is (at the source of Achelos River), and use the following background. Zelligar and Rogahn were two powerful adventurers - maybe they were foreigners, or in service of the Thyatian conquerors, as their motives are described as «based on some kind of vague (or chaotic) evil» and their alignments as «questionable». They began construction of Quasqueton after the Thyatian conquest of the Cruth Lowlands (about AC 910), employing powerful magics, and hundreds of slaves and laborers (humanoids, and perhaps even captured Traladaran rebels); they took advantage of the control that the Thyatian Empire was exerting over this region at the beginning. Construction of Quasqueton took about a decade, and Zelligar and Rogahn used it as the base of their operations for a some time. Things became increasingly difficult when Thyatian control over the Cruth Lowlands began to wane, isolating their dungeon even more than they wished. At last they were forced to intervene directly when a large orcish horde, defeated by the Hins at the Battle of Fire Rock in the Five Shires (AC 944), poured into the Cruth Lowlands. Before the orcs could reach the southern settlements of the Cruth Lowlands, the two managed to lead them into a narrow pass between two hills and routed them. The Thyatian provincial government and the local population rewarded them for their deeds; after that, they again retreated in Quasqueton. Zelligar and Rogahn disappeared years later (before AC 970) in the wild orc territory west of Quasqueton, in what was their last adventure. They left their mysterious dungeon abandoned. Today it has been occupied by orcs (some of whom are the descendants of Rogahn’s and Zelligar’s slaves), troglodytes, and other creatures. B1’s background says that the two characters’ disappearance happened “some years ago”, but the most recent writings in Zelligar’s diary (found within the wizard’s closet, in the dungeon) are more than thirty years old. Thus, if the adventure takes place in AC 1000, Zelligar’s and Rogahn’s disappearance should have happened before AC 970. Likely the two experienced increasing difficulties with the Cruth Lowlands’ humanoid and giant population, which eventually (after a couple of decades) convinced them that the only solution to save Quasqueton would have been fighting directly against their opponents to destroy them outright. Unfortunately for them, this adventure was far beyond their abilities, and the two never returned from their expedition. When this happened, memory of Quasqueton’s precise location had probably already fallen from common knowledge. More than thirty years later, Quasqueton’s name is associated with mystery, treasure, and peril - and spinned around by bards and storytellers. B7 – Rahasia! adventure module introduced the elven village of Kota-Hutan, located in a forest at the feet of the Gray Mountain. There stood a temple devoted to the elves' philosophy, called the Quiet Way, founded by the elves’ ancient spiritual leader, a human sage called Elyas. The followers of the Quiet Way are called the Siswa. While the original module’s setting was generic, later B1-9 – In Search of Adventure supplement placed Kota-Hutan in an area of enchanted forest in the wooded hills east of the Duke’s Road tract which continues north of Penhaligon. The area is known as the Hantu Valley. TOO MANY EYES, OPALS, AND ORBS! According to B7’s background, Elyas was later killed in a fight against three witches who coveted one of the sage’s magical items, the Black Opal Eye, but managed to defeat them, imprisoning their souls under a large mountain (the Gray Mountain), on which the elves later built their temple to honor Elyas’ memory. Magic items similar to the Black Opal Eye were also introduced in other supplements. The first was the adventure The Treasure of the Hideous One, included within AC2 – Combat Shield and Mini-Adventure supplement, where the Essence-Orb of Trikla the Black Seer, a powerful and evil magician of ages past, was described. The second was the Eye of Traldar, a powerful divination magical device introduced in the adventure DDA3 – Eye of Traldar. While these items are unrelated in official sources, as they all have divination powers, it seemed interesting to develop a story that linked all of them together. Some contributions by Mystara fans during the course of the years developed the story which identifies the Black Opal Eye with the Essence-Orb of Trinkla the Black Seer, and which is summed up below. Before the Traldar hero Zirchev became Immortal around BC 870, he trained a mortal apprentice and entrusted him with the protection of the Traldar lands. He gave him two most-powerful magic items with divination powers, two orbs known as the Eyes of Traldar: the Fire Opal Eye and the Black Opal Eye. Zirchev’s apprentice took residence in a secluded place near the Lake of Lost Dreams, and became known as a powerful sage and a benevolent magic-user. He was called by the locals the Seer of the Lake of Lost Dreams, the Seer of the Lake of Lost Souls, or the Seer of Traldar. Various magic-users succeeded as Seers in the course of the centuries, each one trained by the previous Seer. As the Seer’s role became more evident, dark and evil forces began harassing him to eliminate the threat he represented to the fulfillment of their plans, or to steal from him the magic items which made him so powerful. In BC 308, a young Traladaran magician corrupted by the Immortal Orcus, Trinkla, tricked the Seer into abandoning his hideout and, during his absence, stole the Black Opal Eye. She fled to the Blight Swamp, where she hoped to uncover Zirchev’s secrets. During her experiments, she created the magical effect known as the Slough of Despair in BC 282. However, a few years later (BC 276) she died, being buried in a hidden dungeon-tomb in the Blight Swamp. The Black Opal Eye was buried with her. Elyas was born in Alphatian-ruled Thyatis around BC 150. He was one of the first non-Alphatian natives of Thyatis to be trained as a magic-user by the Alphatian wizards because of his arcane potential. He quickly became a powerful wizard, but his studious character kept him away from politics and human intrigues. Years later, tired of the methods of Alphatian government and of the Thyatians' intrigues to regain their freedom, he left his homeland and traveled much, at the end heading for the remote wilderness of Traladara. There, he became a friend of the forest races and did much to help and defend them from monsters, humanoids, dark forces, and outside dangers. In particular he befriended an isolate elven community whose settlements were found in the small Hantu Valley in the middle of the forested foothills of the Black Peaks range. These wood elves, whose main village was called Kota-Hutan, were Callarii who were left there isolated when many of their kins had retreated in the central forests of Traladara after the arrival of humanoid tribes. Elyas came to be highly regarded by these elves, and they gave him the opportunity to settle in their valley. The wizard built a large tower north of the village of Kota-Hutan. He even developed a new lawful philosophy of contemplation and meditation, merging his own lore (gathered along his travels in the world) with elven traditions. This philosophy was called the Quiet Way and the elves of the Hantu Valley became its followers (the Siswa, as they were called). Elyas continued to act for the good of the elves and other forest races. During his adventures, he was noticed by the Seer of Traldar and was later trained to succeed him as the new Seer, which happened in BC 7. Some years later (BC 4), he even braved the dangers of Trinkla’s Tomb in the Blight Swamp and managed to recover the Black Opal Eye. During his time as Seer of Traldar, Elyas divided his time between his tower in the Hantu Valley (where he kept the Black Opal Eye) and the Lake of Lost Dreams (where he kept the Fire Opal Eye). Elyas' deeds, however, again attracted the attention of the dark forces. In AC 3, the Immortal Orcus sent three of his most powerful witches, Karelena, Sorolena, and Trilena, to steal the Black Opal Eye and kill the Seer. They reached Elyas’ tower and used their power to make a huge mountain fall on his tower from the sky; Elyas managed to draw the three witches’ souls under his tower, entrapping them, but was crushed under the mountain, and died. The wood elves of the Hantu Valley honored Elyas' sacrifice building the Temple of the Gray Mountain, devoted to the Quiet Way, on the site of the mountain fall. The three witches’ spirits continued to be imprisoned in the ruins of Elyas’ tower below the temple, as well as the Black Opal Eye. Elyas’ sudden death discontinued the tradition of the Seers of Traldar; there were indeed additional Seers after Elyas, but their power never came close to that of the ancient Seers before Elyas, as a part of their ancient lore was lost with Elyas’ death. Today, the Black Opal Eye is believed lost or destroyed – actually both it and the three witches' spirits are watched under the Gray Mountain by a powerful snakelike being created by Elyas, called Ular-Taman. The Fire Opal Eye – or Eye of Traldar, as it is now known – has stayed in possession of the Seers who succeeded Elyas and who live near the Lake of the Lost Dreams. The adventure module included in AC2 – Combat Shield and Mini-Adventure, titled The Treasure of the Hideous One, introduced the story of Colonel Rosentos, sent about a century ago by Duke Stefan ‘the Heremit' to explore and claim the wild lands west of Luln – that is the Blight Swamp. At that time, the module says, the duke’s land “were very new”. The module features a map, which however is quite difficult to fit within that of GAZ1 – even if AC2 itself clarifies that the map is left very vague in order to be fitted within whichever setting a DM feels right. This allows a certain freedom of use regarding the map, and the possibility to tweak it to fit with GAZ1’s map. As the module’s tale is set a hundred years ago, Colonel Rosentos' mission was likely part of the events which followed the Thyatian conquest of Traladara. However, Luln didn’t exist at that time, being settled by refugees from the Black Eagle Barony after AC 971 - so you can substitute it with the adjacent village of Lenov. [You may even suppose that Luln was born as a ramshackle village of refugees on the verge of Lenov in AC 971, but later its population swelled so much that eventually it absorbed Lenov itself, which became one of its suburbs.] After the occupation of the village of Lenov, Rosentos and his men were sent to explore the Blight Swamp area, to chase some Traladaran rebels who had sought shelter there, or simply to take possession of the sparse fishermen villages found there. Rosentos' superior, Duke Stefan ‘the Hermit’, could well be Stefan I Karameikos, great-grandfather of present Grand Duke Stefan III Karameikos. Stefan I thus would be the father of Boris Karameikos, who is featured in the Karameikos family tree shown in Karameikos: Kingdom of Adventure supplement. Stefan I, before becoming Duke of Machetos, would have been one of the first Thyatian governors of Traladara, as his lands “were very new” at that time. Perhaps he was the very first governor of Traladara after the conquest, or the second one if Flavian Osteropolus – general of the expeditionary force which completed the conquest – was also the land’s first governor. Within AC 910, Stefan I was likely called back to succeed to his family Duchy of Machetos, but he could also have abdicated the throne to his son Boris before dying if he finished his days as a hermit (like his nickname seems to suggest). So the expedition led by Rosentos should have taken place in the very first years of Stefan I’s rule over Traladara, which could be from AC 901 to AC 903. 1 This article uses the version of Mystara's history according to which the Known World (Ethengar, in particular) was the North Pole before the Great Rain of Fire (BC 3000); after the cataclysm, Blackmoor becomes the North Pole and the elven homeland of Evergrun the South Pole. This version is found in most supplements of the Gazetteer series, as well as in the “Timeline of History” featured in the Dungeon Master’s Sourcebook part of the Hollow World campaign set; the latter's poster Outer-World, Precataclysmic Map features instead a differently-rotated globe (with the Known World at about 30°N latitude), and is not used as a source for this article. 2 Brutemen, also called Neanderthals or Cavemen in the D&D Basic Set and Rules Cyclopedia, go extinct in the outer world around BC 10,000 (see Hollow World campaign set) and are preserved by the Immortals in the Hollow World; however, some remnants of their race may well survive to these days, as they are featured in some of the adventure modules (like B5: Horror on the Hill). 3 The tale of Yealeletherveri is told in the Son of Dawn novel (set around AC 1010), where it is narrated by an ancient female blue dragon living in the Altan Tepes mountains, Blethinferelth; according to the story, Yealeletherveri had his lair in the Altan Tepes mountains when the Blackmoor civilization was still young. I've further expanded the setting of Yealeletherveri's and Blethinferelth's stories in my MGAZ1: The Central Altan Tepes (http://pandius.com/altantps.html). 4 The Taymora were first introduced in PC3: The Sea People, according to which they “moved south” and arrived in the “fertile plains surrounding the southern sea”, where they “established settlements along the cliffs and on the plains”. From sparse elements found in the adventure “Voyage to the Bottom of the Sea” (included within PC3), we may argue that - at least at the beginning - the Taymora were a bronze-age civilization with a love for pastoral life. Likely they had not an empire, as canon sources refer to Nithia as the first empire on Mystara after the fall of Blackmoor, but were perhaps more like a collection of city-states. 5 The elves led by the Sheyallia clan split from Ilsundal's migration and settled in the Serpent Peninsula some time after BC 2250 (around this year Ilsundal's migration crossed the Great Waste; see “The Great Waste - Ancient History” in Champion of Mystara - Explorer’s Manual). Canon sources (GAZ9 and Hollow World campaign setting among others) tell us that the Verdier and Meditor elven clans only settled in forested area that will become Karameikos in BC 2100. However, fan sources like G. Agosta's and G. Caroletti's Taymoran timelines (http://pandius.com/taymtime.html) have elven settlers reaching Taymoran lands already in BC 2250. In the present history, I preserved this early elven contact with the Taymora, considering it mostly developed by small elven families, clans, and groups coming from the Serpent Peninsula. 6 I subdivide the elven race into ethnicities according to the work of Marco Dalmonte, Razze di Mystara (http://ddmystara.altervista.org/RazzeMystara.pdf; the book is in Italian); of them, only the wood and fair elves are of some interest for this history. Wood elves (also called sylvan elves) are a little smaller than humans, with fair skin (which tends to tan under the sun), and blonde, silver, grey or brown hair. Fair elves (also called gold or noon elves) are tall as humans, have a paler skin (but with golden tints in some individuals), and dark (usually black or brown) hairs, with rarer blondes or redheads. This history considers the Meditor elves all belonging to the water elf ethnicity, while the Verdier elves to be evenly divided between fair and wood elves. 7 The kingdom of Grondheim is taken from the fan works of John Calvin on “Mystara BC 2300”. The story of the giants’ struggle against the Taymora is further told in Giampaolo Agosta's supplement Lords of the Cruth Lowlands. 8 Besides a short sentence found in PC3 (“The shark-kin inhabit many of the ruined settlements, but there are some places where the shark-kin fear to go. These dark and sinister sites harbour malignant entities, beings whose evil has festered for much longer than they have been covered by the sea” – which, however, can be variously interpreted), nothing in canon specifically supports the connection between nosferatu or vampires and the Taymora, fan-created materials (from the works of J. Mishler and G. Agosta to the more recent ones of J. Calvin) have for a long time worked on this connection, producing very interesting ideas. Thus, this history keeps the idea that the Taymora began to worship Entropy at some point in their history, while leaving the details of the introduction of entropic cults in their culture as vague as possible. 9 This history assumes that the Alphatian lycanthropy was only one of the strains of this magical disease. Other strains in fact may precede the Alphatians’ landfall on Mystara. See Treatise on Lycanthropy by J. Calvin (http://pandius.com/lyctreat) and Lukka, the beast-men by G. Agosta (http://pandius.com/lukka.html). 10 The exact chronology of seismic events of the BC 2000-1720 period is tricky, because canon sources are not always clear and often one conflicts with another. See BC 1700 Catastrophes by J. Calvin (http://pandius.com/cstr1700.html) for an overview of sources and a clarification. Basically, a long period of seismic instability begins in BC 2000, detaching a series of vast islands from the southern coast of the Known World in BC 1750, and culminating with the devastating volcanic explosion of the Kikianu Caldera (see GAZ4) around BC 1720, an event which creates the modern Ierendi and Minrothad archipelagos. 11 See PC3 (“the few surviving Taymora fled the area and settled farther north in the present day lands of Karameikos”). 12 Being “Traldar” the name of the subsequent bronze-age culture that will be later preserved by the Immortals into the Hollow World, and those colonists coming from the Egyptian-like Nithian Empire, I've adopted the name “Ptahr-al-Dar” (originally created by J. Mishler, see his Ancient Origins of the Traladarans at (http://pandius.com/ancotral.html) to identify them. Also, I've considered the Ptahr-al-Dar expedition to be a private colonization attempt, as its later failure does not trigger help or aid from the Nithian Empire, and also becouse the empire's forays in the Sea of Dread happen quite later (BC 1100). 13 GAZ11 clarifies the routes that the Nithian colonists took toward modern Karameikos, saying “The Nithian Traldar clans land in Karameikos. As these colonists spread out, they become the first humans to inhabit Darokin”. It is quite evident that if the Nithians had come to Karameikos by land, they would have settled part of Darokin first (Selenica region, at least); the additional fact that they land in Karameikos further clarifies the issue. Moreover, GAZ1 says that they were “pioneers intent on colonizing distant areas” and that they “settled in the coastal forests in the area now known as Karameikos” – an additional reason to believe that they came from the sea and that there were no Nithian lands nearby. 14 The name “People of the Night” was devised by F. Defferrari in his History of Traladara (http://pandius.com/tralhist.html). About the Nithian conquest of the descendants of the Taymora, see PC3 (“They were later absorbed by the Traldars when they arrived in the area”). I have marked a few Nithian settlements on the accompanying map: Os-Khmin (under modern Specularum) was borrowed from the Fantasy Cities: Specularum project (http://pandius.com/fc_s_hst.html), the Shrine of Key-Hamintep is featured in the adventure Trouble in Threshold (part of Karameikos: Kingdom of Adventure supplement), the Obelisk of Nekhefre was described by G. Agosta in his Lords of the Cruth Lowlands (I only added the name of the site) supplement; other settlements were created by me. 15 The Sons of Night were introduced in the adventure In the Dread of Night, found in “Dungeon Magazine” no. 24; their link with the Taymora, their background and activities were further explored by G. Agosta in his Lords of the Cruth Lowlands supplement. Other known surviving Taymoran sites are marked on the accompanying map: Magos and Kosmoteiros are described in G. Agosta's Lords of the Cruth Lowlands, the Taymoran Temple of Nyx in the same's Crywolf! adventure, while the Taymoran River Fort (under modern Specularum) comes from the Fantasy Cities: Specularum project (http://pandius.com/fc_s_hst.html). 16 See note 13, above. Note that those settlements of the Ptahr-al-Dar in modern Darokin should have had Egyptian-sounding names at that time, becouse the change that transforms the Ptahr-al-Dar culture will only happen later, after their blending with the descendants of the Taymora and their resurgence from the “new” stone age in which they have fallen. In the accompanying map I have included three of such settlements: Serekhermet (on the site of modern Selenica), Sentut, and Pi-Khonsu – all three will be wiped out by the gnoll invasion in BC 1000. 17 In spite of a passage in GAZ1 (“They never forgot the scientific secrets the Hutaaka had taught them – the forging of iron [...]”), the Hollow World Traldars are a bronze-age culture; this means that the Hutaaka never taught iron-smelting to the Traldars, or did it only in the eve of the Great Beastmen Invasion. Thus I supposed that the few iron weapons and tools which may exist in the later Traldar age arrived through trade or contacts with iron-age cultures by Traldar kingdoms that had emancipated themselves from Hutaakan tutelage. 18 Of the Traldar settlements featured on the accompanying map, only Hlas (Lavv), Krakatos, and Mirlenos (Marilenev) have some basis in canon sources; the others were created by me (some of the names or locations were borrowed from F. Defferrari's map of Traladara in BC 1200, here: (http://digidownload.libero.it/Halag/images/Traladara_1200BC.png), even if Oyllenos can be linked with Halav's past (see note 24, below), while Dymos could be the site of the ancient tomb found in the dungeon featured in DDA4: The Dymrak Dread. Regarding the Hutaaka, besides the Temple of Pflarr only Xitaqa (from B10) is mentioned in canon sources; Koxaqa should be the Hutaakan settlement mentioned in GAZ1 under Threshold's description (and found on the site of the subsequent Castle Mistamere), while Achelos is described in G. Agosta's Lords of the Cruth Lowlands. 19 The Hollow World Traldars don't have Hutaakan masters – quite the contrary, the Hollow World Hutaaka live far away from the Traldar kingdoms. This means that the Hutaaka did not have complete control over all the Traldar kingdoms, otherwise the Immortals would have chosen to preserve their cultures in close contact in the Hollow World – in other words, in my opinion this means that there was at least a part of the Traldar culture for which the Hutaakan culture was no longer instrumental. 20 Athenos could well have been founded during the Ptahr-al-Dar age; I chose to have it founded during the Traldar age as part of the exploration and colonization effort undertaken by some Traldar kingdoms in this period. After all, the Hollow World Traldars are quite adept seafarers and sea raiders (Hollow World campaign setting says that “Their war-galleys [...] once dominated the region of the Sea of Dread”), and their expansion in the southern archipelagos is meant to underline this trait of them. 21 The burning of Akorros is mentioned in GAZ10. It's quite possible that what the GAZ calls “Akorros” had a Nithian name at this time, or that a Nithian-named city had later changed its name into Traldar-sounding “Akorros” due to Traldar influence (brought there through trade along the Streel River from Athenos, for example). 22 The history of the Hutaakan dominion of Achelos is described in greater detail G. Agosta's Lords of the Cruth Lowlands. 23 The magic item card “Diadem of the Sun”, whose description features King Tahrek, is found in the Dungeon Master’s Survival Kit supplement. According to it, “Centuries before Halav's mortal reign, central Traladara was ruled by King Tahrek the Bright. [...] The ballad ‘The Tragedy of Dymrak’ says that Tahrek annihilated his beast-man foes with the diadem.” Obviously there were no beastmen before Halav's reign in Traladara, so I supposed that the beastmen of the ballad were actually Hutaaka; just like for the rest of Traladara's history, the passage of time blurred the difference between the jackal-headed humanoids and the gnolls. 24 Both the Hollow World campaign setting and HWR3: The Milenian Empire say that Halav was king of Luln, and that he banded his warriors together in a guerrilla defense which slowed the gnolls’ advance. Halav's story as told in GAZ1 and Wrath of the Immortals instead sees him taking the leadership in Lavv (modern Kelvin) after killing the local king. While mention of Luln in the above-mentioned sources is likely a mistake for Lavv, I think it could be used to further detail Halav's past in the following way. Obviously Luln didn't exist in the Traldar age, but Halav could have well been the king of Oyllenos, a Traldar town found on the site of modern Luln; after a desperate defense of his city, Halav had to flee and abandon it to the gnolls. Oyllenos was destroyed, but he organized a successful guerrilla war against the invaders from the forests, something that began to portray him as a hero before the Traldars. Later, as the gnolls overran the whole western Traldar lands, he tried to convince the king of Lavv to forge alliances with other kings in order to put an united front before the invaders. When the king laughed at him and tried to have him imprisoned, Halav killed him and took the throne of Lavv. The rest of his story is well-known. As a side note, the names Halav, Petra, and Zirchev told by the Traladaran tradition, likely were not the three heroes’ original names; probably – given the fact that the ancient Traldar tongue should somewhat resemble the Mycenaean Greek tongue – they sounded more like Halawas, Pyledra, and Zirkeus, or something like that. 25 While most canon timelines, for simplicity's sake, have all the events of the gnoll invasion compressed in BC 1000, from GAZ1 we learn that “fighting was indeed bloody and went on for years”. Thus I chose to have the climactic Battle of the Volaga River in BC 992, eight years after the invasion had begun. 26 The Vandars are an Antalian-related people native of modern Norwold; they should belong to the same language group of other Slavic-like tongues speaking peoples (see some of the NPCs in CM4, and also the Vatski and Yevo of some fan works - (http://pandius.com/zuyemp.html and http://pandius.com/nrwldreg.html); I included them to explain the passage from the Traldar culture (similar to the Mycenaean Greek one) to the Traladaran one (which is more Slavic-like), and also to establish a link between Slavic-like tongue speaking people of Mystara. The ancestors of the Vandars migrated from Norwold on the eve of the Great Horde's invasion (BC 1722), living first in the Heldann and Northern Reaches area, and then moving to southern Ethengar around BC 1000, pushed away by the Nithian pressure from the south. The Vandars founded the short-lived realm of Zölaströya (http://pandius.com/zlstroya.html) in southern Ethengar, before moving south again when tensions with their neighbours became unbearable (BC 950). They crossed the sparsely-populated Darokin lands following rumors of easy and rich takes to be made in the halfling realm of Hindon. The Vandars should be the humans mentioned in these passages of GAZ8 the Fall of Hindon and the Dark Years: “In the years that followed, human, dwarven, and orc bands roamed the land fighting viciously with each other. [...] Human bands were largely interested in fast and easy plunder but the dwarves and orcs were determined to rule the land as their own.” Thus, before the determination of orcs and dwarves, the Vandars eventually left Hindon for the east, invading the beleaguered Traldar lands in BC 933. 27 At this point the old Mycenaean-like Traldar culture has given way to the newer Slavic-like Vandar one. 28 GAZ1 says that the Callarii migrate from Alfheim around the end of the 1st century BC, and this take is followed by some fan works, like G. Agosta's A Karamikos Companion. However, later canon sources, starting with GAZ5 and Hollow World campaign setting, say that the Callarii clans split from Mealiden's migration toward the future site of the Canolbarth Forest and chose to settle in the deep woods of Traladara while their brethen continued north in BC 800. I chose to adopt this second version, also because I could not see why a number of elven clans should have migrated from an idyllic fairy forest to a lands inhabited by humans and threatened by scores of goblin hordes (like Traladara was in the 1st century BC). 29 The mortal story of Leptar has been devised by Marco Dalmonte (http://pandius.com/hircismu.html) and further linked with Traladaran history by G. Agosta in his A Karameikos Companion. 30 Lugsid is a canonic settlement found in the Hail the Heroes adventure. The names of most other settlements are borrowed from the fan works of G. Agosta (A Karameikos Companion and Lords of the Cruth Lowlands), F. Defferrari (http://pandius.com/tralhist.html), J. Guerra (http://pandius.com/tralclan.html), and J. Mishler (http://pandius.com/daro.html). 31 Ithron is mentioned in Karameikos: Kingdom of Adventure as one of the leaders that managed to claim the title of King of Traladara; his surname was created by me. 32 The character of Lucor is mentioned in B6: “Advancing toward the gate is the Procession of Lucor. The procession is a religious celebration honoring a legendary local cleric named Lucor. [...] The festival is of great importance.” The story of Saint Lucor was further developed by G. Agosta as part of the Fantasy Cities: Specularum project. 33 It's unlikely that literacy was introduced by Thyatians this late. The Hollow World campaign setting, under the description of Milenian customs, says: “Milenian is the language of these people. Though it is descended from Traldar, it is not the same language. There is a written form of the language, which is not at all similar to the written form of Traldar.” So the Traldars did have a written language; literacy among the Traldars surely suffered a hard blow during the Dark Age, but some sort of literacy (based on the old Traldar alphabet) may have resurfaced between BC 500 and AC 400. Despite this, it may be that the Ballad was kept in oral form only out of some religious tradition. I suppose that the translation of the Ballad into Thyatian marks the gradual adoption of the Thyatian alphabet in the religious practices and then in the Traladaran tongue, in place of the old Traldar alphabet. 34 This is another of the short-lived kings of Traladara mentioned in Karameikos: Kingdom of Adventure, where he is featured only as “Ivanovich”. Further details on Bogdan's story can be found in G. Agosta's A Karameikos Companion and Lords of the Cruth Lowlands. 35 The following part about the Traladaran Wars draws on the works of A. Nowack (http://pandius.com/darorule.html) and G. Agosta (A Karameikos Companion). Demara is the third king of Traladara mentioned by name only in Karameikos: Kingdom of Adventure. 36 Of the settlements marked on the accompanying map, Gorenenov (seat of the Gorevitch family) was created by J. Guerra (http://pandius.com/tralclan.html), the Barony of Ivorga comes from the work of J. Mishler (http://pandius.com/daro.html), while Ourosco comes from Night of the Vampire adventure. The village of Lumm is mentioned in X12: Skarda’s Mirror; G. Agosta (A Karameikos Companion) made it an historical Traladaran town, and I'm following his work here (I've only moved the village a little to the south-west, becouse the module says it is “a few miles northeast of Kelven”). 37 The Vargos family was first created by P. Sullivan (http://pandius.com/westkara.html); I have adopted the modified story of the family, as told in G. Agosta's Lords of the Cruth Lowlands, A Karameikos Companion and The Beast of Radlebb. 38 These Traladarans will found the city-states of the Gulf of Hule – Slagovich, Nova Svoga, Zvornik, and the rest. The story of their flight was created by G. Agosta in his A Karameikos Companion and expanded in Crywolf!, and draws from the following passage of Red Steel campaign setting: “an influx of Traldar arrived, possibly fleeing religious persecution in their homeland”. Following the defeat and the exile of the Hojah, the Vargos family took power in Halag, abandoning the old title of “bans” and assuming that of “barons”. 39 Mention of the Traladaran League and the character of Perrantin are found in the Dragonlord Trilogy novels by T. Gunnarsson. I assumed that the whole story of the trilogy takes place between AC 504 and AC 513. For a more detailed description of the events which invested the Known World during this time, see my History of Dragonkind (http://www.gruppoludico.it/naga/History_of_Dragons.pdf). Together with Solveig White-Gold (alias of Valeria Doranius, scion of the Thyatian Emperor Cornelius Doranius, and one of the characters of the trilogy), Perrantin later discovered the relic known as the Shield of Halav around AC 521. The story of their finding, the construction of the Temple of the Shield and of the nearby village of Zadreth on the shores of Lake Windrush are told in Hail the Heroes adventure (exact dating was my guess, however). 40 Mention of Baron Ulstagh's death in AC 612 is found in the Ballad of Nob Nar, in GAZ8. 41 While this event is borrowed from G. Agosta's A Karameikos Companion and from the Fantasy Cities: Specularum project, I chose to keep the dukes of Marilenev in existence after AC 612, even if deprived of their control over the city itself; this is due to the fact that a “king” of Marilenev is mentioned in Poor Wizard’s Almanac I, a Radu (likely his name, not his surname) who happened to be in charge in AC 872. 42 The story of King Aden III of Darokin was created by A. Nowack (http://pandius.com/darorule.html) and expanded by G. Agosta (A Karameikos Companion). 43 What is known about Gygar comes from the background of the group adventure in D&D Basic Set: “Many years ago, this part of the Realm of Man was ruled by a magic-user named Gygar, a man of great and mysterious powers. He ruled the lands from his mighty castle Mistamere, [...] Gygar died after a long and peaceful rule, but no successor was named. [...] Now, centuries later, [...]”. Gygar's story and some of his creations (mostly weapons like Comet’s Edge and the Sword of Gygar) were detailed by G. Agosta in his works (A Karameikos Companion and Lords of the Cruth Lowlands); according to gim, Gygar should have died at the beginning of the Vampire War (AC 720). 44 The Monstery on the Hill was introduced in B5: Horror on the Hill adventure. The place's background was further detailed and integrated with Karameikan history by G. Agosta's A Karameikos Companion and other works. The Monastery's location on the accompanying map follows the hints found in B1-9: In Search of Adventure. 45 Queen Elendorath was mentioned in B12: Queen’s Harvest adventure. Her story was further detailed and integrated with Karameikan history by G. Agosta's A Karameikos Companion and other works. 46 The canonic history of the Traladaran migration toward the Highlands has been expanded by J. Mishler (http://pandius.com/daro.html) and G. Agosta (A Karameikos Companion). 47 Lumm should survive as a small farming village after this event, because around AC 980 its inhabitants are kidnapped by the mad wizard Skarda according to X12: Skarda’s Mirror. 48 G. Agosta in his A Karameikos Companion has both Lugsid and Zadreth abandoned at the beginning of 10th century AC. However, in the Hail the Heroes adventure the location of both towns is nearly unknown to the locals, and it is not unreasonable to think that local folklore had knowledge of their location if they were abandoned only a century ago or so. Thus I found more fitting if the abandonment or destruction of these two towns happened some centuries earlier, and the Holy Wars seemed to me the right time for this to happen. 49 See also note 41. Poor Wizard’s Almanac I says that AC 872 was the fifteenth year of Radu's rule over Marilenev. The cadet branch is the one to which Valor Marilenev (husband of Magda) belongs. 50 The name of Vatresh was borrowed from F. Defferrari's History of Traladara (http://pandius.com/tralhist.html); here, however, the name refers to a much older settlement on the same site. 51 The name of Flavian is found in DDA1: Arena of Thyatis: “The chapel was built by Flavian, grandson of Eusebius and grandfather of Helenites, in AC 901. He built it to honor Vanya for his safety and success in the campaigns of conquest led by Emperor Gabrionus IV against the Traladarans (whose land is now known as the Grand Duchy of Karameikos). Its construction was financed by spoils of the war”. It's quite likely that Flavian was already back to Thyatis in AC 901 (when an imperial governor may have been sent in his place), or that he sent home his accumulated money and gave instructions to build Villa Osteropolus’ chapel. 52 This story was originally created by P. Sullivan (http://pandius.com/westkara.html), and then revised by G. Agosta (Lords of the Cruth Lowlands), whose version I'm following here. Alharbius’ surname betrays his Alasiyan ancestry (the character's name was Muktar al Harb in Sullivan's original writeup). 53 Some works – G. Agosta's A Karameikos Companion and J. Guerra's Traladaran Clans (http://pandius.com/tralclan.html) – have many Traladaran clans and settlements destroyed by the Thyatians during the conquest. However, according to GAZ1 Thyatis’ seizure of Traladara seems to be relatively bloodless, and resistance of the Traladarans to conquest scarce as well. So I chose to have only Boldizsarovich (from the work of B. Yarbrough, http://pandius.com/boldizsa.html), Demiatic (from G. Agosta's Crywolf! ), and Achelos (from G. Agosta's Lords of the Cruth Lowlands) destroyed. Likewise, most of the Traladaran clans marked in red on the accompanying map were exhiled (like the Gogunov, who went to Ierendi, and the Vidrina) or ousted (Vargos, Ivanovich), rather than killed (something which happened to the Boldizsarovich and, maybe, also to the Dragomir). Besides in the Cruth Lowlands and Halag, the Thyatians encountered some staunch opposition from the lords of south-western Traladara – the Ourosco clan and its allies, the Strolojca, the Dragomir, and the Sulescu. The latter's defeat opened the road to the reduction of their lands; the Brezovo and the Moubotka, on the other hands, stayed neutral, and saw their possessions untouched or even enlarged. 54 See G. Agosta's Lords of the Cruth Lowlands for a more detailed account of those events. 55 A siege of Krakatos by a Duke Stefan is mentioned in Bladderwick’s Human Catapult's description in AC11: Book of Wondrous Inventions, and I decided to include it in the events of Marilenev Rebellion. Likely the rebellion was something more elaborated than a street riot, and saw the direct or covert participation of some important Traladaran clans besides the Marilenev, like the Kopul of Radovar, the Dromilov of Dmitrov, and even the support of the exiled Gogunov from Ierendi. The plan contemplated a rebellion of Specularum while a Traladaran army would have descended upon the city from the north to occupy it. The capital's rebellion failed, however, and the Traladaran army was cornered in the ruins of Krakatos, where it fortified itself. Despite a fierce resistance, the Traladarans were defeated; the Kopul were stripped of their title and lands, many of their members were executed for treason alongside most of the Marilenev clan. The Dromilov's clanhead (who after all had had a limited involvement in the events of the rebellion) chose to reach the Gogunov in their Ierendian exile and thus the family managed to keep their lands – albeit losing the whole northern half of them to the Barony of Vorloi.